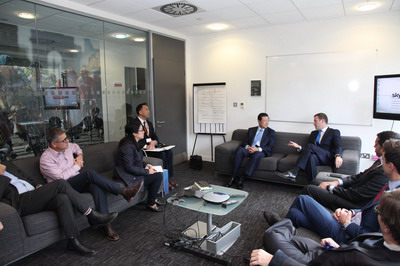 On 12 October, 2015, Ambassador Liu Xiaoming paid a visit to the headquarters of Sky News, where he held a discussion with John Ryley, Sky's head of news, and senior editors and correspondents responsible for the coverage of the Royal Family and diplomatic, political, economic and international affairs. Ambassador Liu began the discussion with Prime Minister David Cameron's remarks about 2015 being a "golden year" in China-UK relations. He emphasized that President Xi Jinping's state visit to the UK, the first by a Chinese president in a decade, could not take place at a better time. By giving China-UK relations a new position, by setting new goals and sketching a new plan, President Xi' state visit will herald a "Golden Time" for China-UK relationship. It is therefore a visit of great significance and rich contents, and will hopefully achieve fruitful outcomes. People of the two countries have high expectations for the visit. The Ambassador hoped that Sky News, as an important TV station in the UK, will conduct a comprehensive and in-depth coverage of the state visit, helping the British people appreciate the significance of this visit and the "Golden Time" in China-UK relationship. John Ryley said that Sky News attached great importance to President Xi Jinping's state visit to the UK, and senior editors and correspondents present at the discussion would all take part in the continuous coverage of the state visit from many perspectives and in an all-round way in order to help the audience fully understand the latest development in China-UK relations. Ambassador Liu also answered questions from editors and correspondents on China-UK economic and trade cooperation, China's investment in the UK, China's views on UK-EU relations and wildlife protection. British Sky Broadcasting is the second largest TV station in the UK after the British Broadcasting Corporation (BBC), and the largest pay-TV provider in the UK. Its Sky News is the only 24-hour news channel forepart from BBC News, and has more than 7.5 million subscribers.